We have given this job a one spanner rating, as if you follow the instructions step by step this is pretty simple. Many poeple are confused by electrics, but take your time and you will be fine. Tools you will need a decent set of electric terminal pliers, not we say decent, not the type you can buy on many "markets"! A very inexpensive modification you can carry out to improve the lighting on your 6V Lambretta, is to use a new regulator to convert the flywheel output to 12V. This conversion can be carried out on non battery or battery models. If you want to use the battery type conversion you need a regulator from a Vespa PX with battery, and of course if converting to non battery, you can use a non battery Vespa PX regulator. You can convert non battery models to charge a battery for use with. Buy yourself a Vespa PX or P200 regulator, a length of wire, and a couple of spade connectors. Take the existing junction box of the scooter as this will no longer be needed. If you wish to keep your scooter looking standard, you can leave it in place, and find another place to hide your new regulator. Now you need to connect all the existing green wires together as these are ignition and are unaffected by the modifications. The brown wire from your stator assembly goes to the terminal on the regulator marked "G" there are two of them but any will do). The two remaining wires from your stator are no longer needed, so tape them together out of the way. Now you need to connect all existing wires from the main loom in to one wire, a nice tip is to fit ring terminals on them all, and fix a bolt through the ring terminal holes, thus bolting them all together. In doing this, make yourself one extra wire, this will connect all the wires you have just connected to the other terminal on the rectifier marked "G". Lastly, the terminal marked "E" on the regulator needs to be connected to a good earth.. That's it apart from changing to 12 volt bulbs, and riding in the dark! You can carry out this modification on a battery model Lambretta using the above mention 12v regulator, but from a battery model Vespa which has an extra B+ terminal. Take the brown wire from your stator the the terminal on the regulator marked G. Take a wire from terminal - and put it to earth. 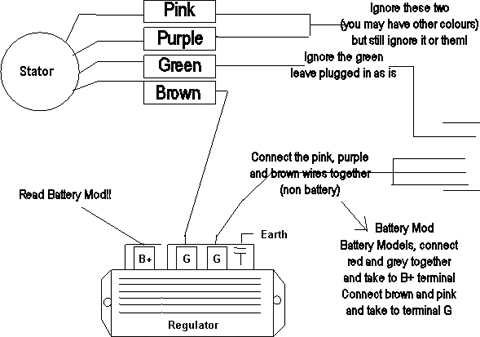 The other terminal marked G on the regulator will then need to be connected to the Brown and purple in your main wiring loom. Connect the red and grey from your wiring loom to the B+ terminal. Change your front and rear bulbs, horn and battery to 12V and away you go.